Is Chicago’s Housing Market Worth Investing In? Chicago’s Housing market like a few other housing markets, is recovering from the last recession, yet the political uncertainties of 2019 and the upcoming 2020 election hang heavily on the city’s future. The windy city is plagued with high taxes, shaky financials, and restrictive government regulation. Up until a few years ago, it suffered a lack of construction and investment. With wages and employment sagging, there’s little to drive builders to build new homes in this giant city of 2.7 million with a GDP of 690 billion. Despite all these issues, its housing market is similar to others and may be worth investigating for its rental income potential and modest asset apprecations forecast. In fact, rent growth in the city rose to 2.5% as of last November according to Yardi. They state that occupancy in stabilized assets dropped just 20 basis points over 12 months, reaching 94.6% as of October. They estimate that over 5400 apartment units were released up to November. As deliveries have slowed, particularly in the loop region where Millennials are hunting for apartments, prices there have risen. One report from the Chicago Tribune suggests an apartment rental shortage will happen despite significant construction and releases of late. The number of rental units completed is expected to slow to 3,500 in 2020 and 2021. And the Tribune reports there are 4,185 units currently under construction in Chicago’s suburbs. This won’t be enough to satisfy demand in metro Chicago. And with current apartment rental prices being comparatively high given Chicagoan’s cost of living and job situation, the potential for rental property investors might not be so bad. Between buying vs renting a home, Chicagoans may choose to rent for the next decade and you can tap into that multifamily market demand. This graphic courtesy of Yardi, shows the fast growth of lifestyle renters in Chicago (those who can buy but instead choose to rent). Wages in greater Chicago (annual income of $44,600) have suffered which makes home ownership dreams difficult to realize. Unemployment remains high at 4.8%. With only 45% of residents owning their home, we could dub Chicago as a renter city. According to NAR, the national median existing single-family home price in the 4th quarter 2018 was $257,600, the highest in a decade, and up 4% from the fourth quarter of 2017 ($247,800). 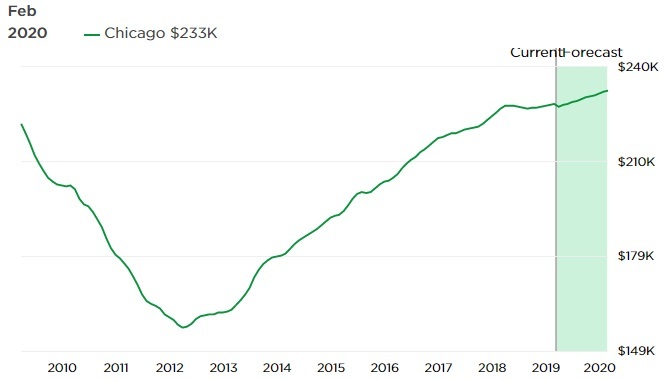 The average single detached house in Chicago was $243,300 in Q4 2018. Foreclosed property sales are dropping, yet are still a big part of the Chicago housing market. Foreclosures and short sales were 4.9% of all homes sold in the city last summer according to Chicagobusiness.com. Smart Asset says price/rent ratios are at 20 for an average $239,831 house at a $1000/month rental. That contrasts with the top city of San Francisco at 50, and Oakland at 41, Honolulu at 39, Los Angeles at 36, and down the rung a ways, Pittsburgh at 18. Illinois Realtors Association reported that sales dropped 10% in January and prices overall fell 1%. The predict average homes prices will hit $241,145 by year end and sales will grow by 9.6% on an annualized basis. Contrast that price with averages in New York $410,000, Boston $477,400, Los Angeles $590,800, Phoenix $269,800, Las Vegas $288.800, San Jose, $1,340,000 and San Francisco housing market average at $987,500. 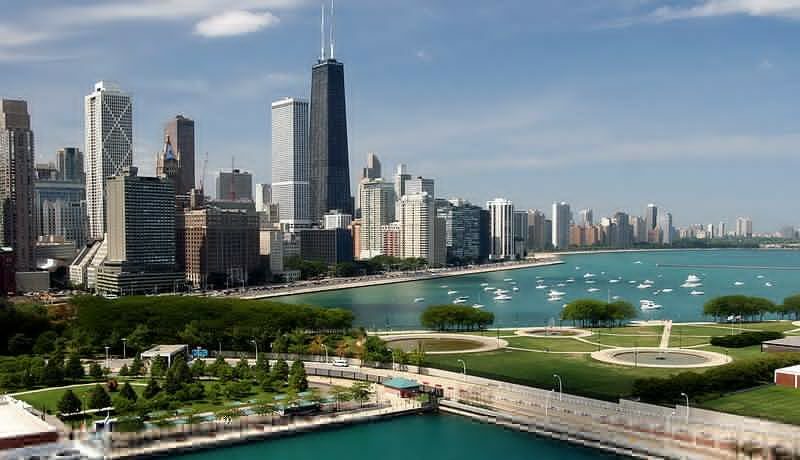 Chicago however, is one of America’s largest cities, even after the major population exodus of the last ten years. Since the US high tide of economic growth will raise all ships, it mitigates any kind of disastrous forecast some may have of the windy city. Like San Francisco and New York, there’s always demand. Zillow forecasts Chicago home prices will bottom out right now, and rise a little by years end. 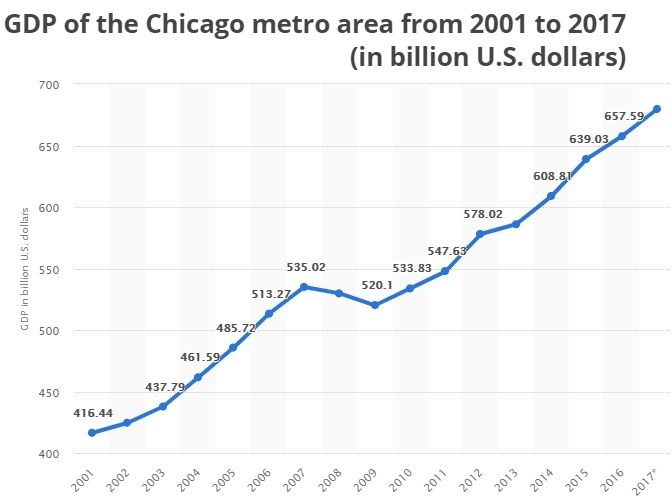 Clearly, no one is predicting a boom in the greater Chicago area. The Chicago housing market is also plagued with more underwater mortgages than any other city. Almost a quarter of a million houses, condos, and apartments are worth less than their mortgages. That’s 16% of homeowners across metro Chicago. Some 20% of these mortgage holders owe twice as much as their homes are worth! Acquiring foreclosures is big business here. One of Chicago’s priciest, most prestigious neighborhoods, Chicago Loop, Lakeshore East and Illinois Center – pic courtesy of Wikimedia. As of February 2019, the average rent price in Chicago is $1,893 which is up 5% from last year. A third of Chicago’s rental apartment stock rents above $2000 per month. For a city with employment and business issues, it still ranks number 10 for highest rents of US cities according to Zumper. 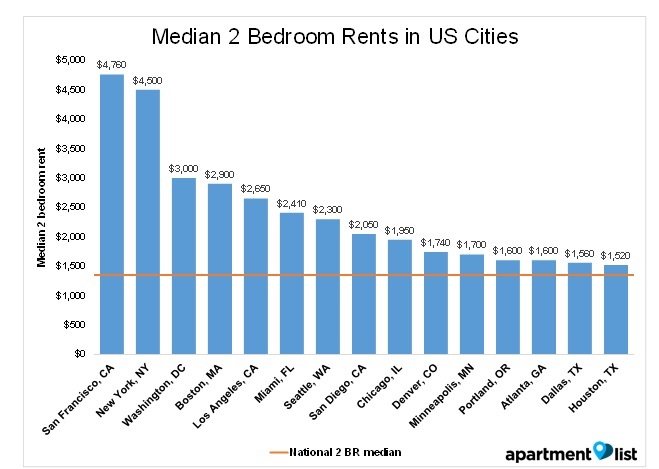 Cities such as Nashville, Minneapolis, and Atlanta have lower rents. Chicago rents haven’t kept up to the national average, yet they’re up there with rents in San Diego and Denver. 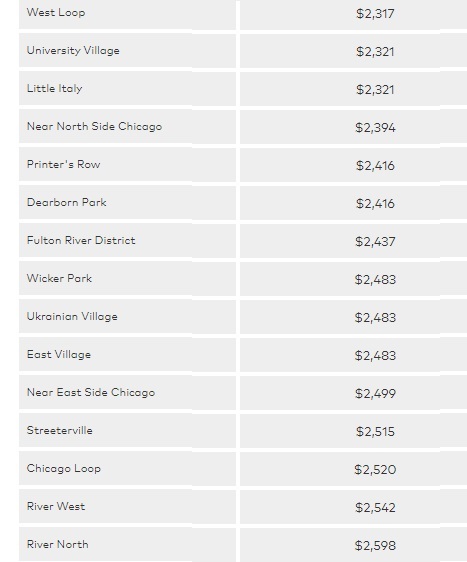 Which Are Chicago’s Most Expensive Neighborhoods to Rent in? 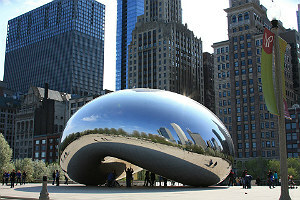 Chicago Loop is very popular with young professionals who want to live/work/play. Google, Salesforce and Facebook are said to be looking to expand in downtown Chicago. 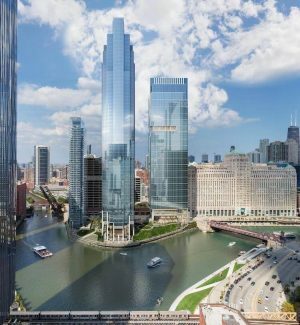 Salesforce, the San Francisco tech giant, is expected to create 1,000 new jobs within its new base, a 57-story tower (at right) on the north bank of the Chicago river in the Loop. Institutional investors have focused on the Loop for both established properties and newer multifamily developments. And they’re very interested in transit routes including next to Metra stations (commuter rail) and rail lines. Cap rates are expected to remain in the high 4% range. Mark May 8th on Your Calendar – We’re Coming to Chicago! 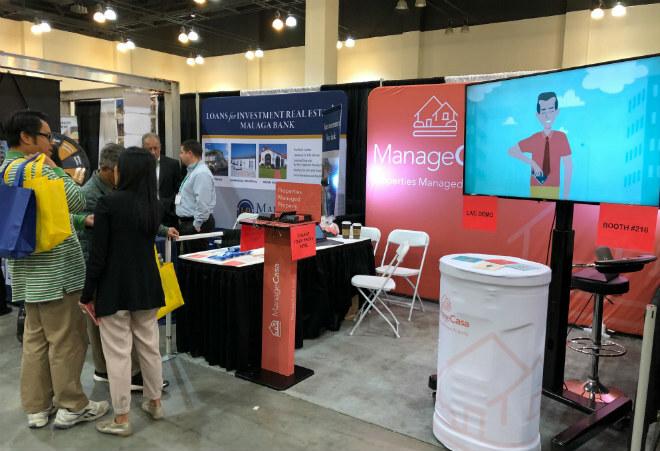 ManageCasa will be at the Cooperators Chicagoland Expo on Wednesday, May 8, 2019 at 10:00AM–3:30PM in the Donald E. Stephens Convention Center – Rosemont, Illinois. Fresh off our successful shows in Hawaii and Pasadena, we’re excited about the Chicago Expo. Come on out and meet the ManageCasa team.